Inside The Market: Event-study strategy. R are the returns, expressed as a percentage, respectively of a single bond (the subject of the analysis) and of the benchmark (a market index). by combining the previous aspects, it means to make profitable a trade just buying or just selling the stocks (it depends on the specific situation) a moment before the event (some days, a week or a month before). The success of the strategy is not absolute but it is very true as the event is significative and repeatable. As known, the market is unpredictable and facing the same news, we could have a different market reaction. The following case shows the strategy. We speak about the full year 2016 results of Moncler S.p.A. The press release is dated 28, February 2017. (To read the complete document, see the link https://monclergroup-dunebuggysrl.netdna-ssl.com/wp content/uploads/2016/07/Moncler_Press_Release_FY_2016.pdf). Post-event window, useful to value the impact of the event in the following days. In this way, we can build the regression : we take the historical returns of the stock (Moncler, Y) and of the market index (FTSE-mib, X). The regression is shown in the following image. The parameters of the regression are the following (see the table). For the returns (change %), I used the historical data from Investing.com and I put them on a spreadsheet. The estimation window is the period from March 3, 2016 to February 23, 2017 (in the image, there are some hidden cells, for space requirements). 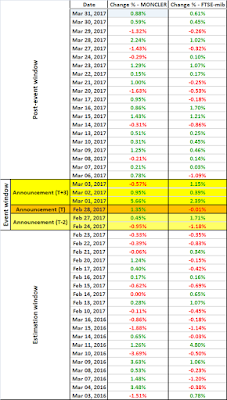 The event window is the period from February 24, 2017 to March 3, 2017. 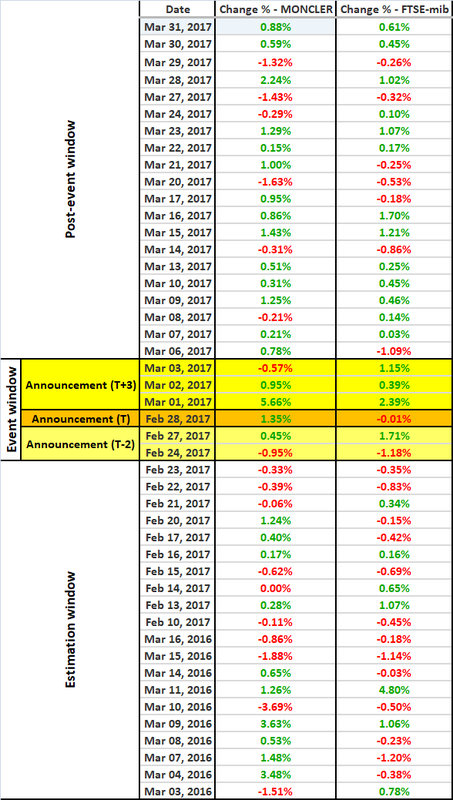 The post-event window is the period from March 6, 2017 to March 31, 2017. With the regression, we measure the abnormal returns (AR). (Effective return of the stock - Estimated return from the market model). The estimated return is equal to [α + β*(effective return of the market index)]. The AR test t is : AR / STD.ERR.(YX). To understand if the AR is significative and so if the event is price-sensitive, it needs to measure the statistic significance of the AR : is the absolute value of the AR test t is greater (YES) or less (NO) than 1.96 ? We can conclude that the earnings release impacted positively on the stock prices and that the event was significative. Just buying before the event, betting on the publication of good data, it would have been profitable. The following image shows the candlesticks chart of the event. As I previously said, the good success is basically based on the repetition of the event and the importance of the event itself. It means also that there is the same market reaction in every occasion (it is not so obvious).